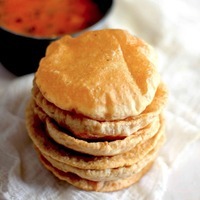 How to make perfect Puri is no secret mantra, all it requires is bit of practice. Puri or Poori is renowned Indian puffed bread. These plump, spherical deep-fried breads are native of Indian sub-continent. The culinary tour of the by-lanes of old cities is never considered complete without enjoying Puri dipped in piping hot bold curries. To prepare the dough for puri, first sift the flour in a large bowl. Add salt and semolina in the flour. Stir to evenly combine. Add 2 tablespoon oil in the flour mixture. Mix with your fingers. Now using 1/4 cup of water at a time bring the flour together to form dough. Make sure not to use too much water. We need firm yet pliable dough. If the dough is on a stiff side do not worry by kneading you can make it soft. Knead dough for next 10 - 15 minutes, more you need more soft puris would be. The good kneading time is one of the tricks to best puris. Rub the Poori dough with a teaspoon of ghee. Cover with a muslin cloth and let it rest for next 10 minutes or so. Now heat oil for frying puris in a deep heavy bottom pan ( buy it here ) over medium heat. Divide the dough into small or medium size pieces. Shape each piece into a round ball by rolling in between your palms. Similarly prepare the balls from remaining dough. Before rolling out Poori grease rolling pin and surface with a teaspoon of cooking oil. Roll out one ball at a time into a small and thin circle. The size of the puri should be small to medium. Make sure not to roll it out too thin or thick. Once the oil is sufficiently hot then test by adding a pinch of dough. If it floats to the surface, the oil is sufficiently hot. Add one poori at a time and fry gently pressing down with the frying spoon or slotted spoon in a circular motion. Turn over when puffed up and fry the poori till golden brown on both sides. Transfer puri to a plate lined with paper napkin. Serve Poori hot with a vegetable curry. Yum. My best friend in college is West Indian, she would talk about dal/poori all the time. This recipe reminds me of her and I am glad you shared this recipe.